Part of the remit of the York Fair Trade Forum is to support our local Fair Trade businesses & those local businesses who are proud to stock Fair Trade products. This special feature lists some of them. Do contact us if you would like to nominate others. Do also check out our full list of Fair Trade businesses on this website. This tardis like shop looks small on the outside but is crammed to the rafters with fair trade products of every description. A marvellous opportunity to admire the vast range of fair trade products including handicrafts, fashionable clothing, stylish jewellery as well as a full range of foodstuffs. Not to be missed. This shop is an absolute treat. It specialises in quality fairly traded crafts, ideal for gifts or a great way to decorate your home. They also stock an impressive range of fairly traded recycled goods – ethical, inventive & also great fun. This wholefood shop is a great York institution. It stocks a fabulous range of organic & Fair Trade foodstuffs. Well worth the short walk to fashionable Fishergate. Essential for all those interested in ethical & healthy eating. This off license on the corner of Goodramgate and Aldwark has a bright, fresh modern feel. The shop has a wide range of Fairtrade products and the friendly owners Matthew and Sarah say that whenever they have a choice they will always stock a Fairtrade product. Do check out their range of Fairtrade wines, beer and even Fairtrade rum. For those who haven’t been to the Bishopthorpe Road shops recently you’re in for a big surprise, it’s a vibrant shopping area & the jewel in the crown is the Good Food Shop. A great range of healthy foods & the owner is proud to stock a range of Fairtrade products. A gem of a little shop crammed with all manner of tasty treats. Another great deli with a lovely selection of fresh produce. As well as selling some Fairtrade products they also do takeaway Fairtrade tea & coffee. This excellent shop specialises in promoting Yorkshire produce. 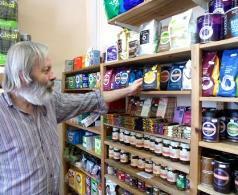 The owner is also keen to stock Fairtrade foods. If you haven’t seen this relatively new shop before it’s well worth a visit. Aroma serves Fairtrade tea, coffee & drinks and where possible Fairtrade ingredients are used to make homemade produce. A range of Fairtrade gifts are also available. Aroma is a great place to relax and meet friends. Opening Hours: Open 9am-5pm from Monday to Saturday. York’s amazing Art Gallery has a trendy cafe in the foyer where you can enjoy a Fairtrade drink. On fine days you can sit out at tables in the square and appreciate one of the finest views in York. An excellent spot to relax with a Fairtrade tea or coffee. Although Blossom Street is abuzz with noise, it seems a million miles away in the calm ambience of the Convent; sure to help you unwind. A fabulously trendy place to hang out with a Fairtrade coffee. Calm & sophisticated by day, somewhat swinging in the evening. A lovely place with a relaxed atmosphere on York’s trendy Gillygate. Cosy and delightful, serving Fairtrade coffee. Well established as a popular lively cafe with great food & chance to enjoy a Fairtrade drink, just steps from the Minster. Fairtrade beverages in relaxing surroundings. The ideal way to recharge on a shopping trip to popular Monks Cross. This museum tells the story of York’s history of chocolate production. There is also a cafe and a shop where you can purchase delicious Fairtrade chocolate, including Choc Affair products made in Naburn. Literally perched on the bridge, this is a bijoux gem of a place that will serve you a great Fairtrade coffee. A long standing supporter of Fairtrade. They have a great range of coffees that are all Fairtrade. The cafe itself is a lovely place to sit & relax & enjoy the panoramic views of the riverside. In the basement of the cinema complex you will find the Gateway Internet Cafe, where you can enjoy a Fairtrade drink & tap away to your heart’s content. A lovely cafe serving Fairtrade drinks. Delicious snacks available. Excellent location close to Clifford’s Tower and the Castle Museum. All vegan, this colourful cafe / restaurant offers a great range of food. All hot drinks are Fairtrade & Fairtrade ingredients are used in some of the regularly changing recipes. Enjoy a Fairtrade coffee at the award winning visitor attraction. A beautifully restored venue, home to meeting rooms, classes, workshops and holistic treatments. The cafe has several Fairtrade treats. Naburn Station is an open air cafe on the sustrans route 65 cycle path (just beyond Saturn in relation to the solar system). It is a 45 minute cycle from the Millenium Bridge and an ideal trip for families. Picnic and toilet facilities are available to everyone whether they buy from the cafe or not. They are open weekends and bank holidays 10am – 6pm offering a small menu with fairly traded and local produce where possible. They serve fairtrade tea, coffee, hot chocolate, juices and cereal bars. Cakes, sandwiches, ices and other all day snacks are available. An exciting new addition to Acomb’s cafe scene. Enjoy Fairtrade drinks and snacks and take in the views of the traditional village green. A great place to hang out with a Fairtrade drink & watch the world go passed the vast panoramic windows. Excellent food available. Enjoy your Fairtrade tea & coffee at breakfast at the excellent Cornmill Lodge, as well as being Fairtrade accommodation it is also vegetarian. Very close to the city centre in historic Marygate, this fine hotel and restaurant serves Fairtrade coffee. Maude and Tommy has become an iconic clothing shop; the place to go for fashion followers with a conscience. The shop specialises in ethical fashion including fairly traded pieces. Do check out their distinctive collection. A popular regular stall at York Market, Black Yak is a Fair Trade supplier of high quality, stylish clothing, crafts & accessories from the Himalyas & Nepal. Linda of Choc-Affair produces exquisite Fairtrade chocolate products. Specialising in selling handmade Bolivian products such as handbags, rugs, ponchos & handicrafts. Based in Selby but run by an active member of the York Fair Trade Forum All’s Fair sells the finest fair trade crafts and gifts at markets and events across Yorkshire including Living North Live at York racecourse. They supply the fair trade goods for the Fair Trade Forum’s community stalls.